My kids love Valentine’s Day. The look forward to coming home from school and pouring over each and every valentine that they receive from their classmates. Then, I have to hide the candy and dole it out over the course of the next few weeks. So, when my friend Jamie at C.R.A.F.T. asked if I’d like to be part of her valentine printable blog hop, I was excited! Some of you may be joining me for the first time from Vanessa at Tried and True, and I welcome you to Makely! 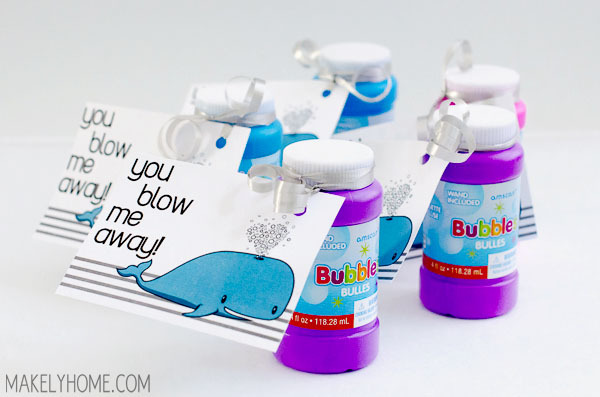 I wanted to attach bubbles to the printable for both Zack’s (8) and Emma’s (3) classes. But, Zack thought those were “a little bit babyish” for him. So, we decided to use the same theme but give his friends bubble gum instead of bubbles. Both of these valentines are available for you to download and use yourself – for free! They each come with 6 per page. You can print them out yourself on your home printer or send them to a copy shop to have them printed for you. I bought the bubbles at Party City for about 50-cents a piece (but you can find bubbles just about everywhere). At Party City, I also bought some clear treat bags and a large bag of bubble gum. I punched a hole in the top of the valentines and attached them to the treats with silver curling ribbon that I already had on hand. Both kids are really happy with their valentines, and they can’t wait to hand them out! Now, I just have to keep explaining to them that they have a whole month to wait before the big day. 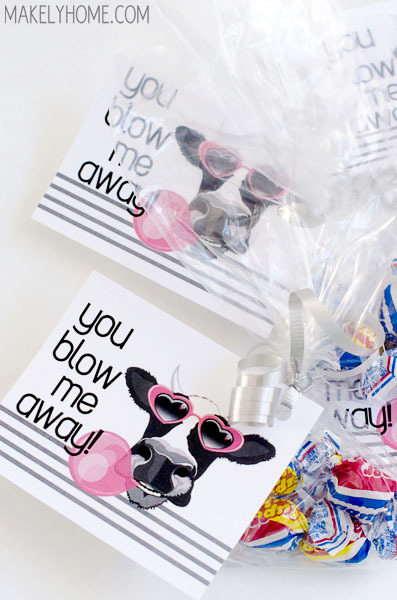 Ready for more free printable valentines? The next stop on the blog hop is Jamie of C.R.A.F.T. herself! She’s a local Austin friend and I just love her to pieces. She has some of the cutest ideas – I can’t wait to see what she came up with for Valentine’s Day! Hey there Lindsay! How are you! These are over the top fabulouso!! LOVE LOVE LOVE THEM! Printing them out for me! Sending hugs and wishes for a picture perfect day!!! What an adorable idea! And affordable! We might just have to do that for my kids class mates! So darling! Love the little illustrations! This is such a great idea im sure I could use them for something else besides Valentines.